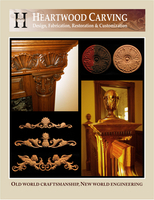 #MLD-ACA: A wood carved moulding of the very popular alternating acanthus leaf. #MLD-CDW: A wood carved molding of the very popular celtic double weave braid. #MLD-CEL2: A tapered wood carved moulding of celtic interlocking knotwork. #MLD-CELK: A tapered wood carved moulding of a celtic round interlocking knotwork. #MLD-CELN: A wood carved moulding of the celtic interlocking rings with a nouveau form on top. #MLD-RING: A wood carved molding displaying a series of interlocking celtic rings. #MLD-STSD: A wood carved moulding featuring a repeating pattern of starfish and sand dollars.